All the classic flavours in this German-inspired dish play off against each other in a most delightful way. 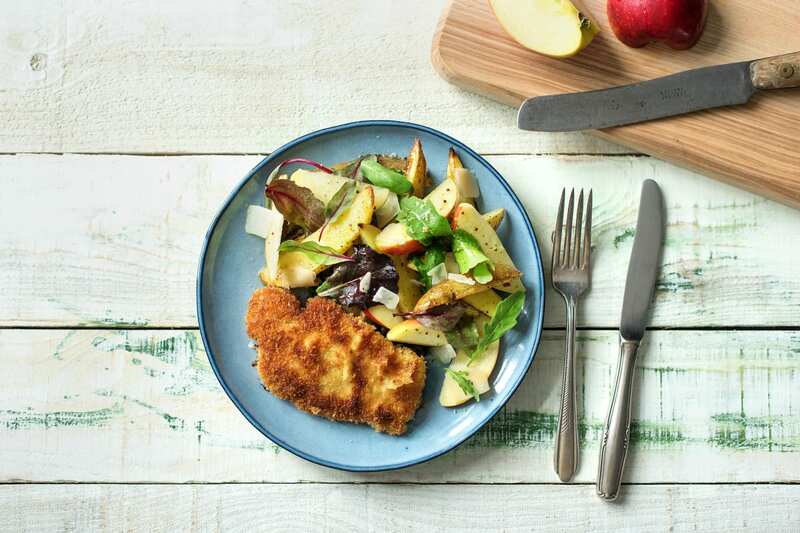 The sweetness of the honey and apple against sharp Parmesan and crunchy pork is just lovely! To prepare the ingredients, whisk the egg, wash the rocket leaves, thinly slice the apple into wedges, and shave the Parmesan cheese. Set up the crumbing station. Prepare three shallow bowls. In the first, place the plain flour and a good grind of salt and pepper. In the second, the whisked egg with a dash of water. In the third, the panko breadcrumbs. 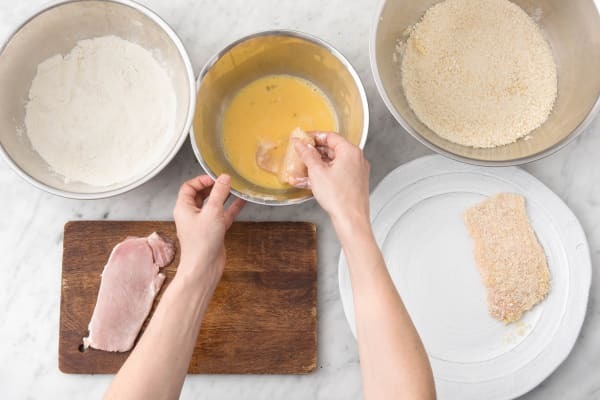 Take each pork schnitzel fillet and dip in in the flour, then into the egg wash, and then into the breadcrumb mixture. Lay them out on a plate, ready to fry. Tip: If you don’t have an egg, replace it with 2 tbs milk. 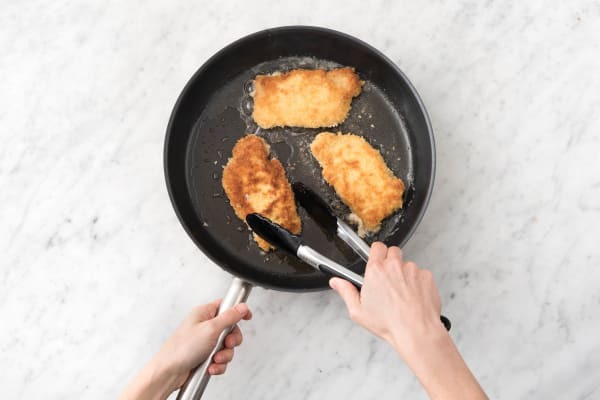 Heat the vegetable oil in a large frying pan over a high heat. Fry half the crumbed pork for 3-4 minutes on each side, or until golden on the outside and cooked through. Set the pork aside on a plate with paper towel, to soak up any excess oil. Wipe the frying pan clean if needed and repeat the process with the remaining pork and some extra oil if needed. 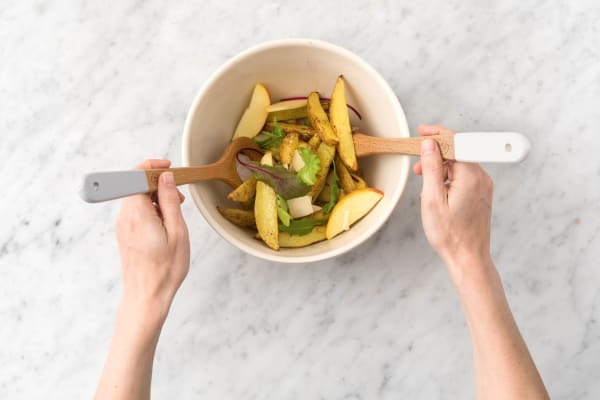 Combine the rocket leaves, apple slices and shaved Parmesan cheese in a large bowl. In a small jug combine the olive oil, honey and apple cider vinegar. Season with salt and pepper. Drizzle the dressing over the salad. To serve, divide the pork and salad between plates. Enjoy!